I've been looking for a small cathode ray tube dinosaur for some time now. Part of the reasoning is the whole retro video thing that I'm obviously into if this blog is any indication. While it's certainly nice that HDTVs currently support composite video for formats like VHS and LD, watching old horror flicks on these archaic sets are what I remember from growing up. 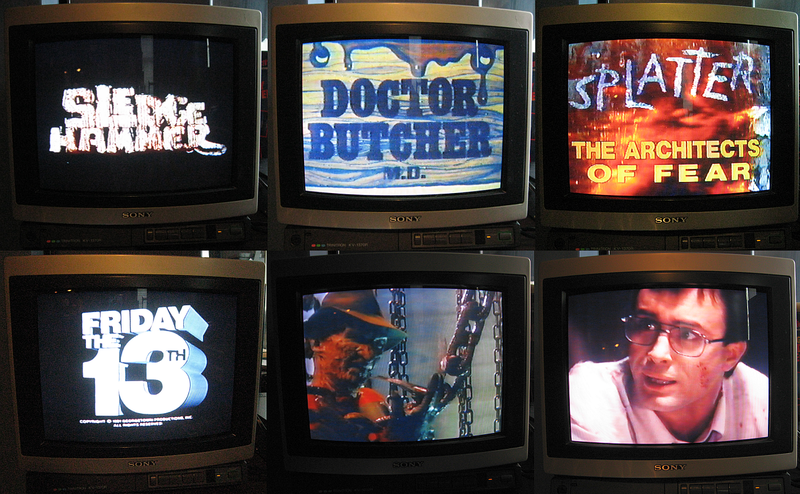 Plus dead formats, even DVD to a certain extent, were originally designed to look best on CRT sets. So it just made sense to be on the outlook for a set in good cosmetic and working order. Especially since practically no one else cares anymore. 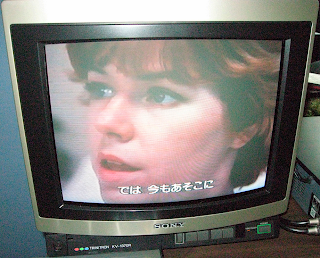 Several weeks ago, I was at a thrift shop and came across a 13" Sony Trinitron KV-1379R from the mid '80s for twenty-five bucks. I was instantly fond of the "cute" styling of the ancient television. Upon closer inspection, someone had broken off the set's rabbit ears and the top's plastic wood grain finish looked hit with an electric sander. So that was no deal and the last time I saw the poor thing it was relocated in a corner with a bad crack across its curved screen. This past weekend at the first swap meet I stopped off at, down the very first aisle, sat another 13" Sony that looked virtually identical--a KV1370R. After looking through the entire place, I trekked back and there it still sat, lonely and trembling over its fate. Pretty good shape, missing the wireless remote, but I couldn't get the best look with the sellers hovering over like vultures for some reason. How much? A measly three dollars. It was just up to me whether I wanted to carry it back. Needless to say there I am, pushing through gawking crowds cradling a television most would throw in a dumpster. For the price, I figured that's where I could chuck it if the thing ended up being a paperweight. It's amazing how much awkward attention arises when showing interest in dead technology. It was like I was carrying a wounded child or something by the looks. Getting home, I took the time to look over and clean the set. Turned out to be in surprisingly great condition for supposedly pulling kitchen duty for years. Hardly any marks on the plastic wood grain shell and zero scratches on its screen. Just the usual hardened finger sludge on the buttons and a broken plastic latch on the front picture control door. After some wiping and some scrambling for an open outlet, the big test arrived. Hitting the power button, I was greeted with a satisfying "click", some crackling, and after a few seconds the screen glowed a bright white with the word "VIDEO" in the upper right hand corner. Like many vintage NES consoles, the set still works and it's awesome. Perfect for its new purpose of emitting horror and exploitation images of all sorts. There's knob controls for Hue, Color, Brightness, Picture (old term for Contrast), Cable On/Off, and buttons for adding and erasing channels. An illustrious mono speaker is at the top of the cabinet and actually doesn't sound bad despite its weird placement. On the back; a cable jack, composite video jack, and a single audio jack. A headphone jack is located on the front panel along with power, volume, channel, and TV/Cable buttons. I wanted to hook it up the my RCA VDT-600 VCR (see my video here), but that deck is substantially larger and heavier than this TV. I'd have to have a dining room size table to sit them both together. So my DVD/VCR combo is playing the part. I might eventually haul out my CED and back-up LaserDisc players to let them join in on the fun. What's old is new again indeed. Gaze upon the retro radiation! Pretty nice for $3. I usually come across newer sets around that size for $10 or so at the swap meet. Enjoy! I agree, it definitely adds something to the nostalgic experience to watch on an old-style TV. I have my VCR hooked up to an ancient beast that also has all my vintage video game consoles connected to it. Now that is dedication! I actually did the same thing - purchased an old analog TV at a church sale - but mine was to hook up some old video games out of the way in a back room. I really like your application though! You know, vinyl lovers kept their format alive long enough for it to come BACK to a modern store like Best Buy...who knows, maybe a VHS revival is in the offing a few years down the road...Great post! Cheers! Beautiful! That Splatter title screen looks fantastic. I regret selling my absolutely stunning Metz widescreen CRT a couple of years back. I like my LCD as it's so light and thin compared to the 65Kg monster that was the Mets Artos. It cost me $4400 in 2001, I sold it for a hundred bucks :( I like your new screen as it's just the right size NOT to be too cumbersome! 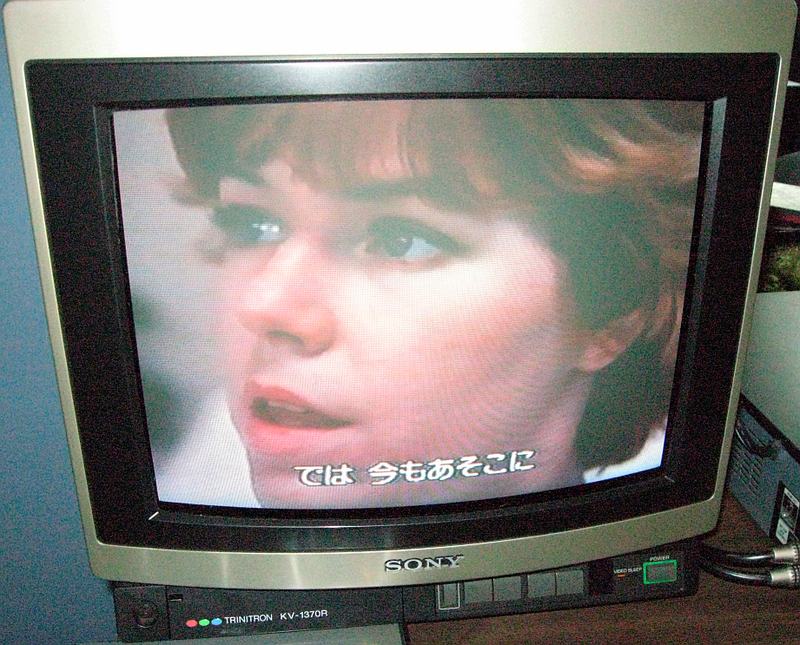 Its incredible to realise that VHS on an old CRT TV actually gives a better picture than Blu-Ray on a HD Plasma TV, when are millions of people going to realise that they`ve been conned by supposedly superior technology that is in reality inferior. Your devotion to the genre puts the rest of us to shame! Great post. I think you've just shown me what I've been looking for. I was going in the complete opposite direction trying to keep up with technology when it was there all along. My nostalgia has grown as I moved away from it, and yet I always tried to recapture it in the wrong way. As a kid, I used to have a nice 5-18 inch Sony similar to this. I loved it. My mother just decided to give it away when I had gotten a bigger television. I was pissed because the picture quality for it was superb. Especially for NES, Genesis, TurboGrafx-16, and SNES games. Looking at these screens just made me realize how amazing the things we took for granted were. Those pics are beautiful and hold so much warmth. Fuzzy, cozy, warm memories. Hey, I know this article is old, but I just wanted to say thanks for this. I found this EXACT TV at my local Goodwill for $10 and I'm thinking of going and picking it up on pay day if they'll let me test it before I buy it.